Three Fourths Home: Extended Edition is an award-winning and critically acclaimed visual short story that explores the emotional ties of family relationships. In her mid-20s, Kelly has been forced to move back to Nebraska. Back to that flat expanse, that seemingly endless sea of rustling cornstalks peppered by rusty silos and rustier towns. A typically intense Midwestern storm is approaching while Kelly is out. She has to get home. In the 20 miles between her grandparents' crumbling barn and her parents' house, she receives a phone call from her mother. Assume the role of Kelly during her drive through the storm. While driving through a stylized representation of rural Nebraska, players navigate an extended conversation between Kelly, her parents, and her younger brother. Through dialogue choice and simple driving mechanics, the story delves into a specific moment of these characters' lives and their relationships with one another. 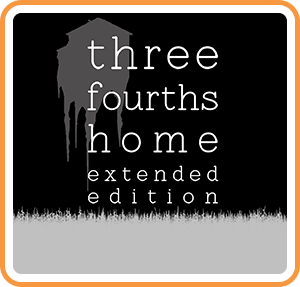 Three Fourths Home: Extended Edition includes an epilogue that expands on the story of the main game. Set at a bus stop in snowy Minnesota, this epilogue examines Kelly's past as well as the effects that the events of the main story have had on her.